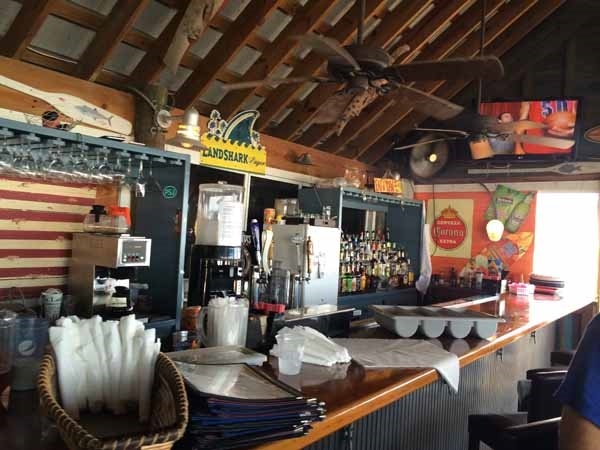 On our press trip to Gulf County Florida we were excited to be given the opportunity to dine at a number of wonderful restaurants in the area. 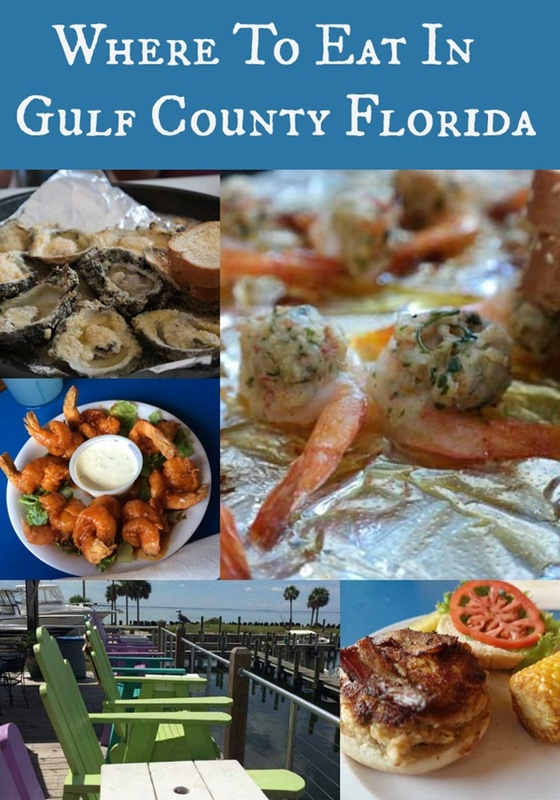 Gulf County is known for it’s seafood and we found it on every menu prepared in a variety of ways as well as a number of other delicious dishes that we couldn’t wait to try. 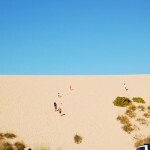 We had such a wonderful time on the trip that we recommend everyone visit the area. 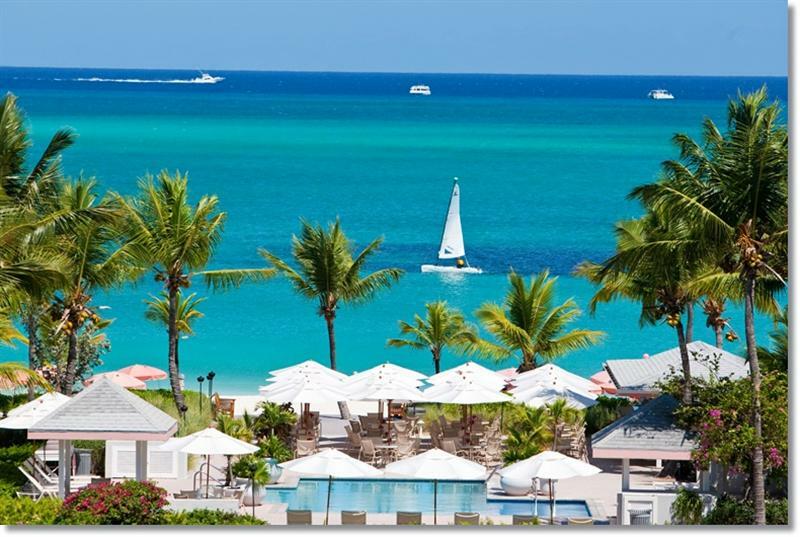 And while you are there here are some fantastic restaurants to try. 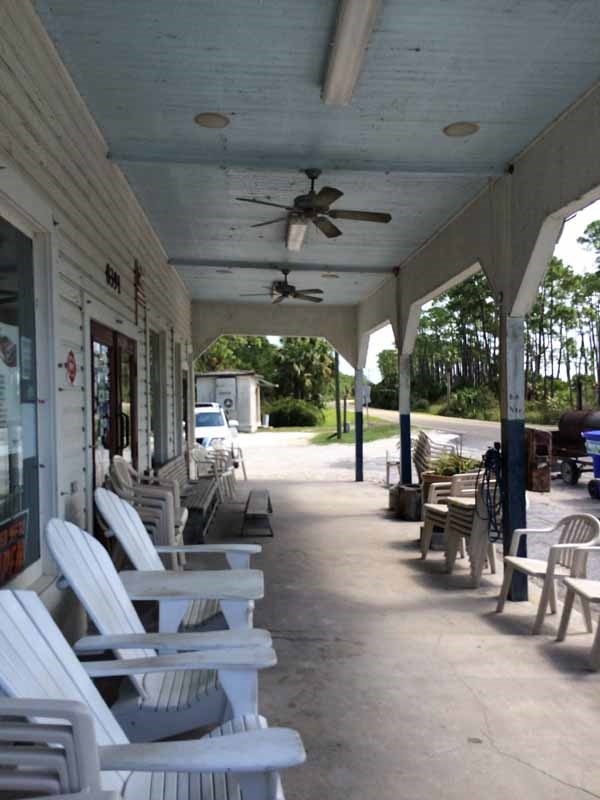 I love that the Indian Pass Raw Bar website declares “you won’t find a hostess and you won’t find a dress code that requires a suit and tie.” Its inviting front porch lined with wooden chairs and benches make you want to pull up a seat and sit a spell before you head in. Before you grab a seat they invite you to grab a drink from the cooler. 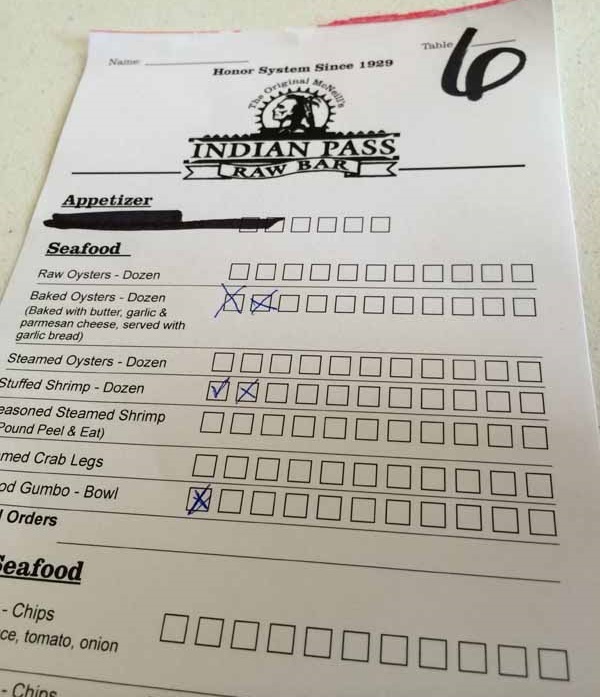 The Indian Pass Raw Bar operates on the honor system. Yes, you read that right. You grab a drink and are given a sheet of paper to check off your beverage as well as your order and then hand it to an available server. After you eat you take your checklist to a cashier and she rings you up. As you can see noted on the sheet, they’ve been operating on the honor system since 1929. This falls under their motto, “Simple But Good” and we found this to be true. The atmosphere is casual, the menu isn’t large, but the experience and the food are remarkable. The menu offers something for everyone and we tried a bit of everything. The Stuffed Shrimp was fantastic. Very flavorful and delicious. 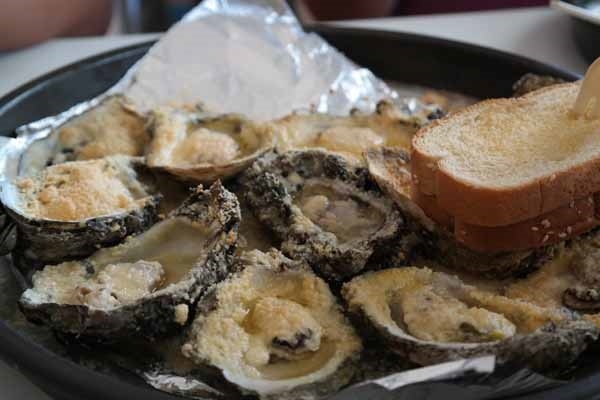 The Baked Oysters were something us Clevelanders had never tried before. 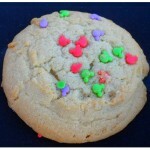 They were wonderful and we would order them again as well as recommend them to anyone who visits the restaurant. 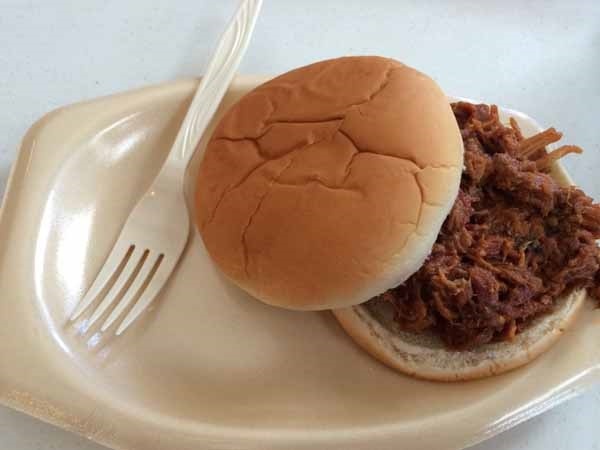 I also had the BBQ Sandwich which was hit the spot on a summer day. The sauce was sweet without being too tangy and the meat was tender and juicy. 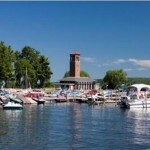 I was excited to hear that the place is packed in the evenings and on weekends. I can understand why. The food is good and the casual atmosphere is fun. 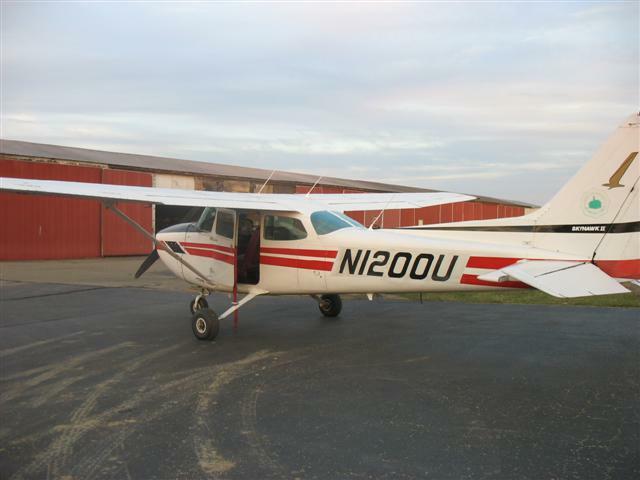 You feel like you are hanging out with family and friends on a Sunday afternoon. 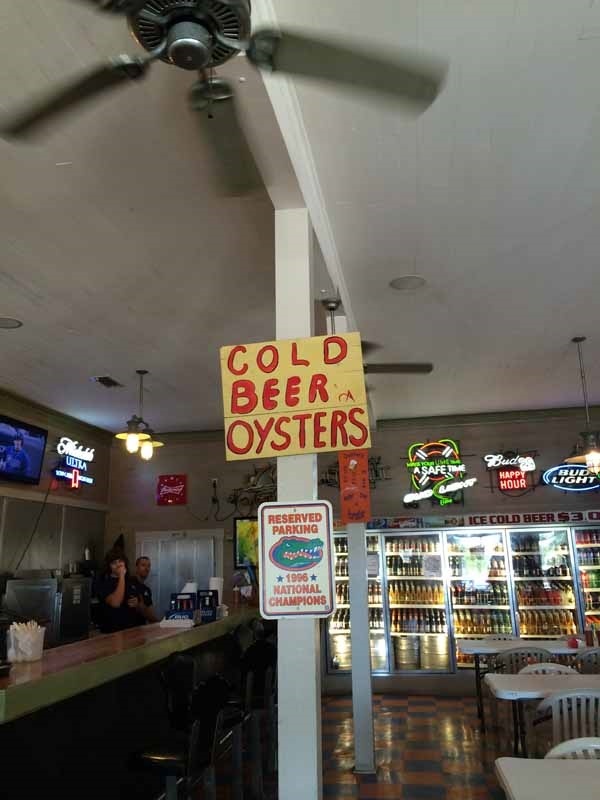 I was also glad to hear they have made some impressive lists by significant publications including: Best Restaurants of the South by Southern Living (who also called it “quite possibly the best seafood shack in existence”) and 50 Best Southern Bars by Garden and Gun. 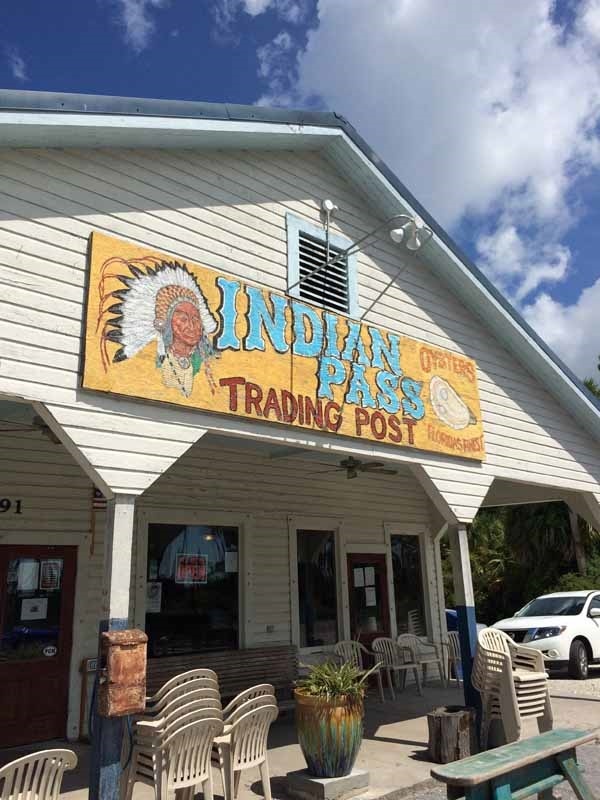 The Indian Pass Raw Bar is a must stop when you are in Gulf County Florida. 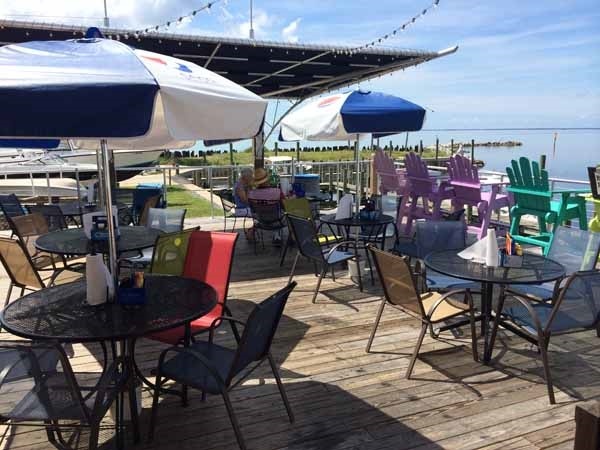 As you enjoy the oysters, shrimp, seafood gumbo, the BBQ sandwich, and the casual atmosphere you find yourself sitting back and relaxing, which is a great way to start off any vacation. 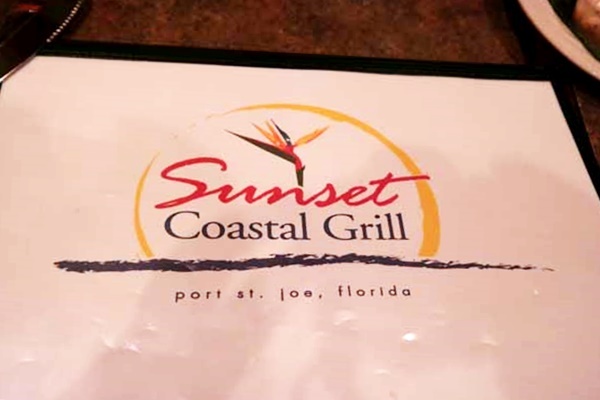 While Sunset Coastal Grill is known for it’s bayside sunsets, we didn’t get a chance to catch one while we were there. We dined after dark but even so the restaurant was lovely, the owner was very pleasant and friendly, and the food was fantastic. The menu is large and I was wishing there was a way we could try ever single item on it! 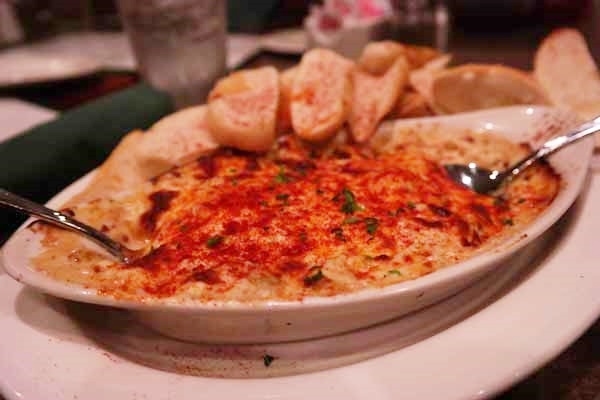 We did try the Hot Crab & Artichoke Dip which is a house specialty and we loved that it was flavorful and served hot with crostinis. I had the Lobster and Shrimp Salad and was impressed by the size of the lobster, the shrimp, and the salad itself. They were grilled and well seasoned and the salad was a healthy portion with blue cheese crumbles, bacon, chopped eggs, cheese, and tomatoes. Dave tried the TripleTail. This is an extremely popular dish in the area and he had heard such good things that he looked forward to trying it. To order it he selected form the “Swimming” menu where choices included Gulf Grouper, Red Snapper, MahiMahi, and Cod Filet. Then he selected baked, grilled, or blackened and chose his finish he selections included: Pecan Crusted, Pecan Lime Butter & Crabmeat, Cheddar Cream Sauce, Thai Red Pepper, Artichoke Mushroom & Red Wine. It was a very unique and creative way to order and he loved that he was able to customize his order to what he was in the mood for that night. Unfortunately we were both so hungry at this point that we at our food before we realized we didn’t snap any pictures! Shame on us. It looked as amazing as it tasted! The good news is here’s a photo of some of the menu items thanks to Gulf County Florida Tourist Development Council. I was excited to read on the website that the restaurant was designed so that every seat in the primary dining area has views of the sun setting over St. Joseph’s Bay. I’ve seen photos and they look stunning. This fact as well as the outstanding dishes have me adding Sunset Coastal Grill to my must visit again list next time we are in the area. I recommend it to anyone looking for fresh local seafood, flavorful steaks, fine dining, complimented by beautiful sunsets. 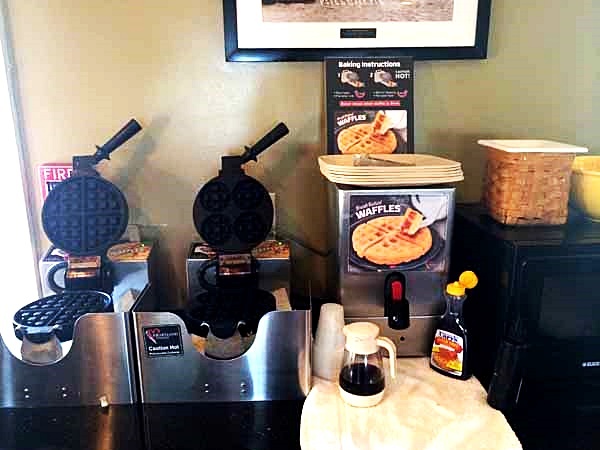 If you are looking for a hearty and delicious breakfast this is the place to be. 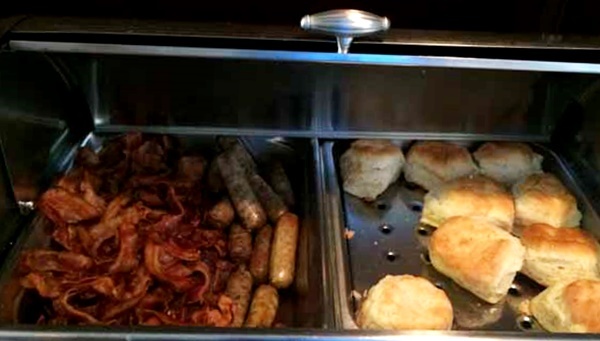 7 days a week for 7 dollars the Port Inn offers a fantastic breakfast buffet that is open to the public. 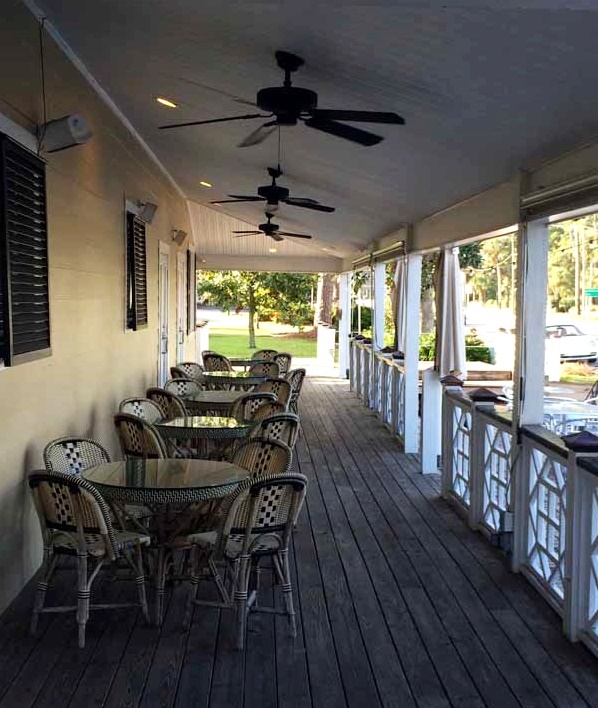 They have a nice breakfast room indoors, but on a beautiful day try eating out on the lovely porch where you can enjoy the Florida sunshine, blue skies, and splendid buffet. 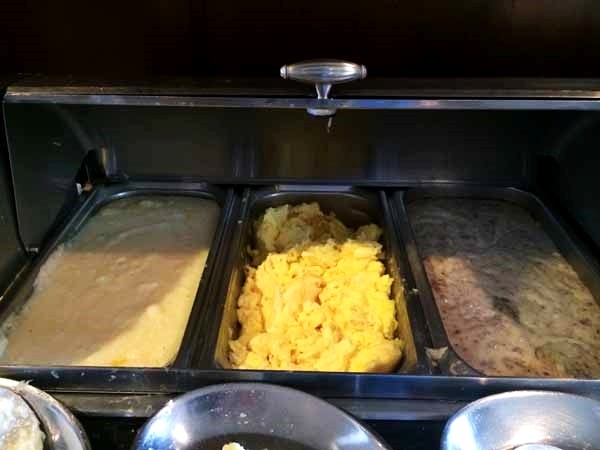 For only $7 you can enjoy a varieties of breads and bagels, cereal, scrambled eggs, biscuits and gravy, Belgian waffles, and even made to order eggs. 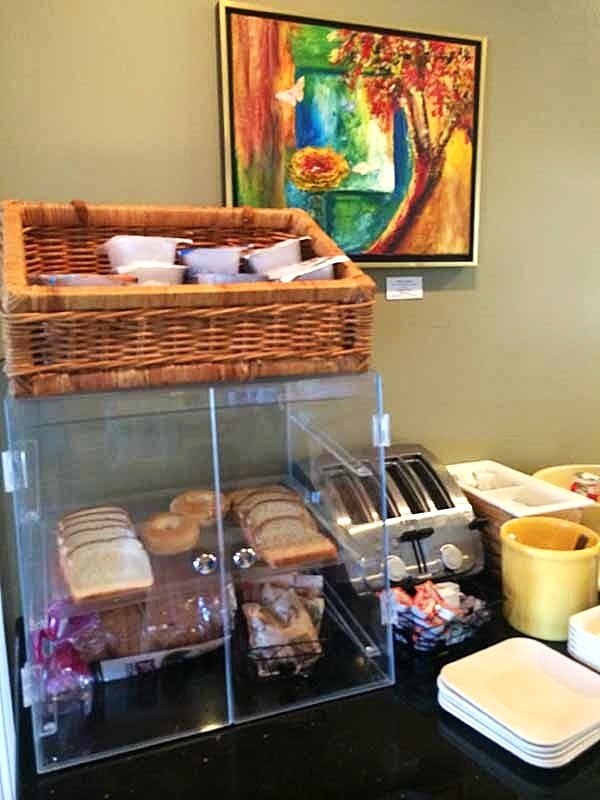 There is also coffee, tea, water, and variety of juice. All of this for only $7 and it’s available 7 days a week. 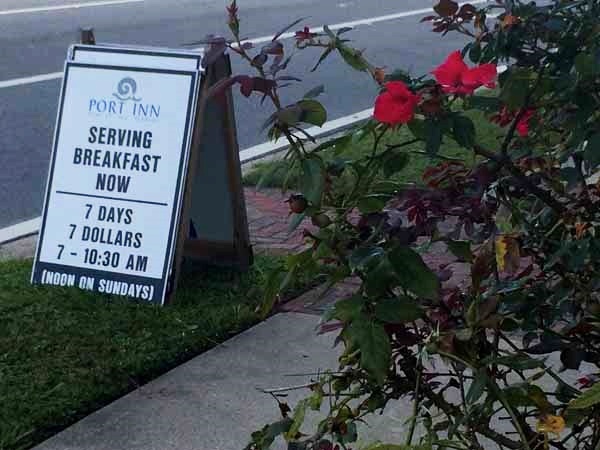 I recommend the Port Inn breakfast to anyone visiting the area who is looking for affordable and delicious dining. It’s money well spent and a great way to start the day. 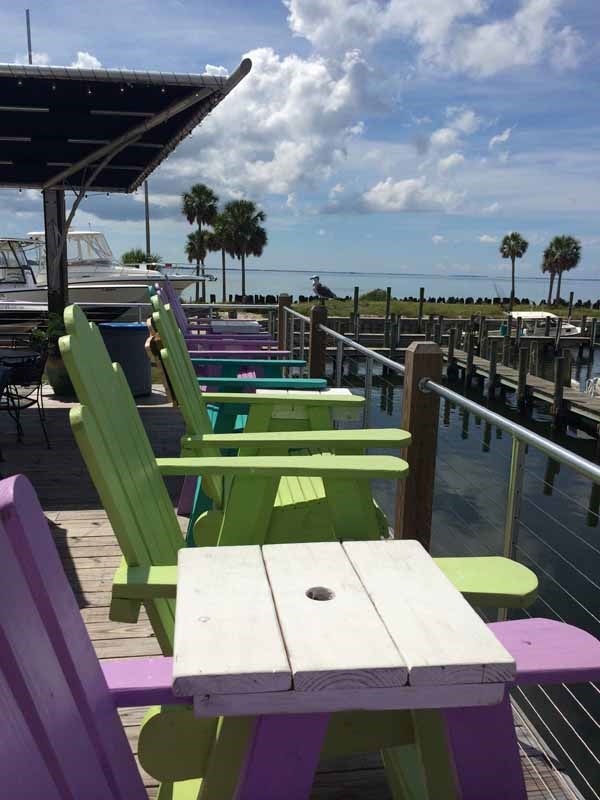 We passed by Dockside a number of times on our various boating trips and I was intrigued with the venue, the deck, and the beautifully painted high wooden chairs. I liked that you could grab a seat and gaze out over the marina. You could even eat your meal here thanks to the nice sizeable tabletops connecting the chairs. It was a gorgeous view on a gorgeous day and truthfully I could have sat here for hours. But since the sun was blazing we decided to head inside to enjoy our meal. I love that the restaurant has a tiki/surf shop feel to it. All of the lighthearted signs and beach/surf decorations really made you feel as if you were on vacation. 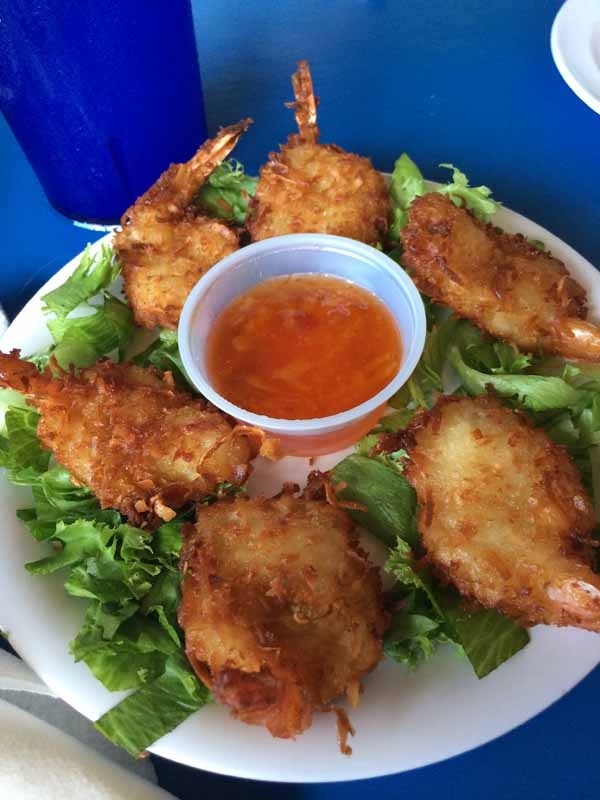 As did our first appetizer – Coconut Shrimp. I have to be honest and say I’m generally not a fan of coconut anything, so I was a bit wary when these came out. However, after having my first bite I was ready to take the appetizer plate away from the rest of the table and eat them all myself! I would order these again (maybe even 2 or 3 plates!) in a heartbeat and I highly recommend giving them a try. 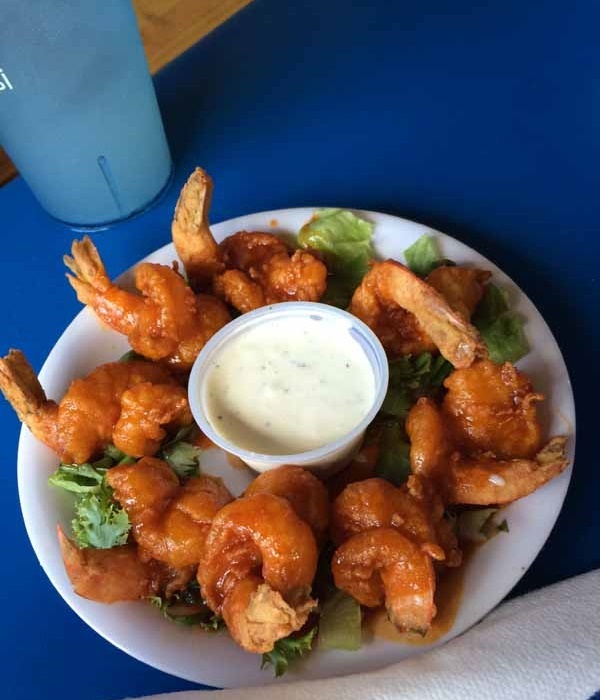 We also had the Dockside Buffalo Shrimp which were a huge hit for Dave. He loves anything buffalo flavored and with a bit of kick so these hit the spot. I found them to be flavorful and fun as well, but for me they were no match for the Coconut Shrimp. 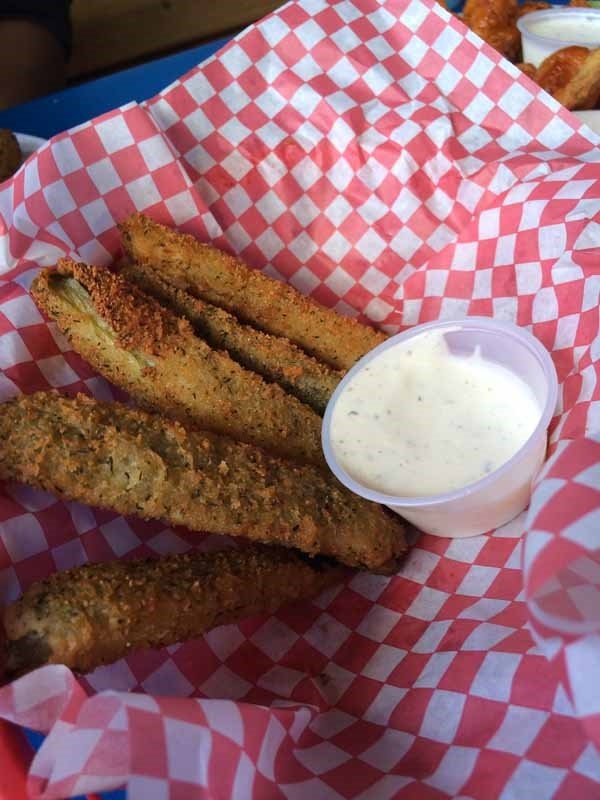 We also tried the Fried Pickles. One of the guys in our group had never had fried pickles before so I was interested to get his reaction. As soon as he took a bite, his eyebrows went up and he went in for more. He declared them really good and we all agreed as we dined on the spears. 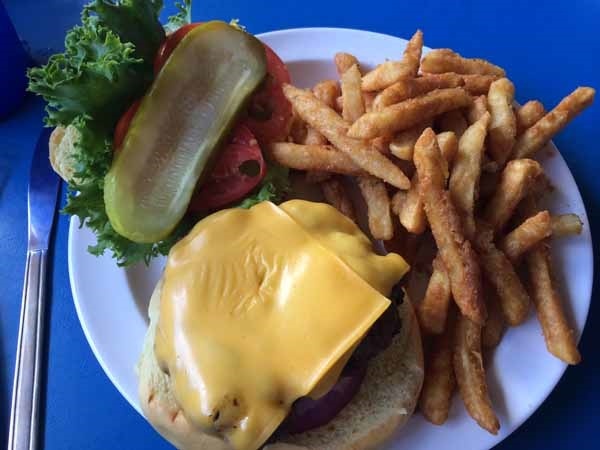 For lunch I had the Paradise Cheeseburger which was a good size and very filling. 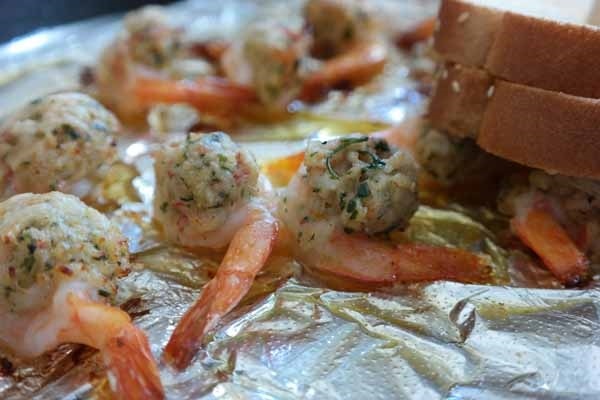 I enjoyed the grilled flavor and how it took me back to warm summer days grilling in the backyard. 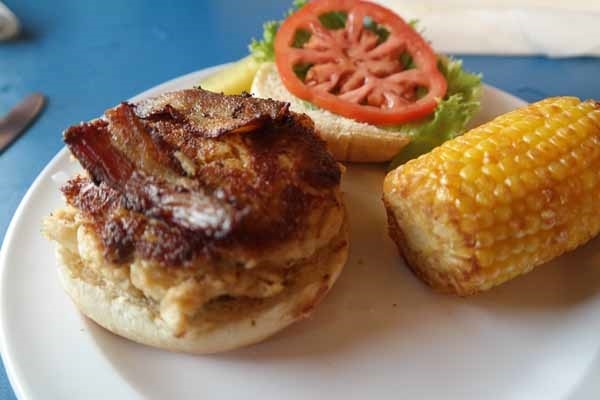 Dave had the Crab Cake BLT which was a large handmade Maryland Style Large crab cake on a toasted bun with smoked pork belly, lettuce, tomato, and remoulade. He was excited to try the pork belly and crab cake combo as that was new to him and when it arrived it looked amazing. After taking a few bites, he did say it was pretty spicy and needed some stronger flavor, but that was ok because it would encourage him to try something else on the menu next time we visited. 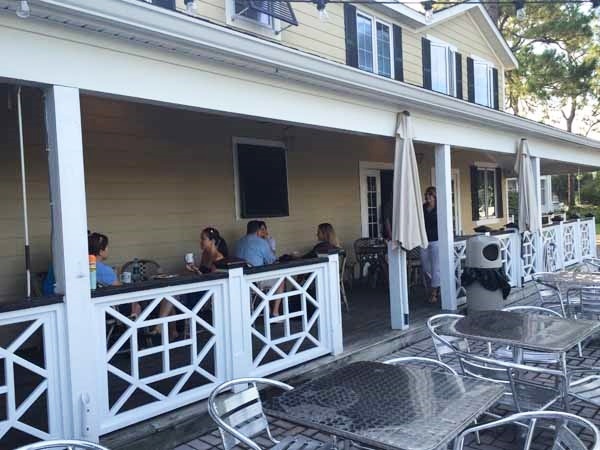 Dockside Seafood & Raw Bar is easily accessed by land or sea and the menu has a wonderful mix of options perfect for anyone looking for a delicious lunch or dinner or snack in between. 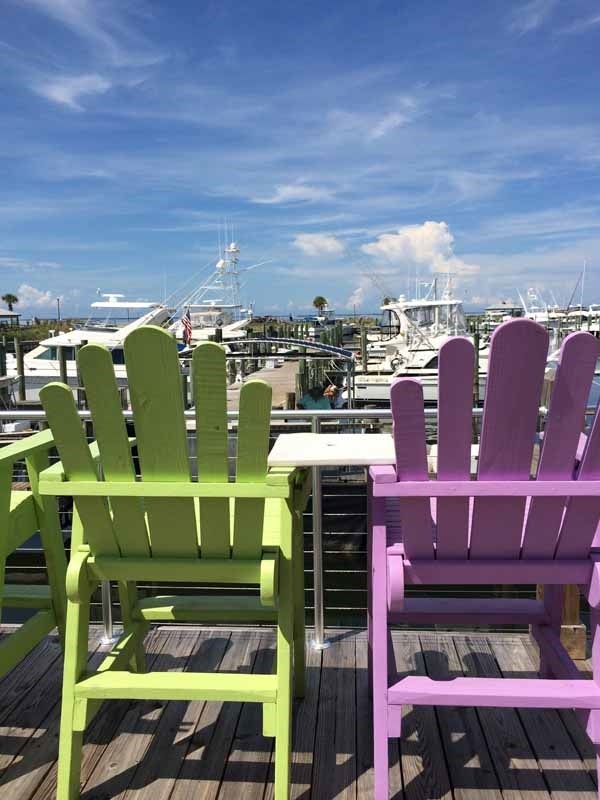 With it’s beautiful location overlooking the marina you truly feel like you have gotten away from it all as you dine at Dockside. Lunch at Provisions wasn’t originally on our personalized itinerary but we were extremely glad we made the change and took the time to dine here. The motto on the website is very fitting: Fine Wine, Cold Beer, and Great Food. We found the atmosphere to elegant and upscale and the menu to match. 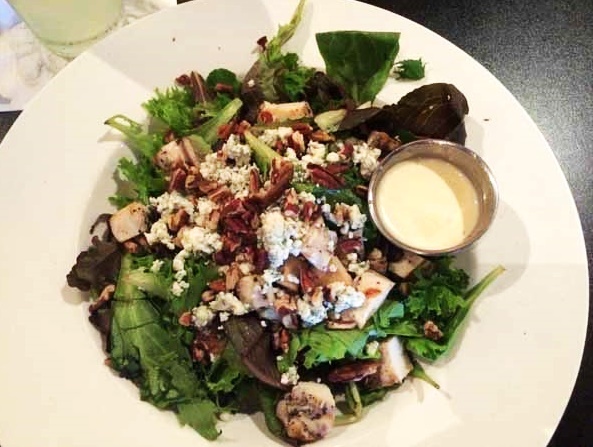 I had the Georgia Girl Greens which are baby greens with toasted georgia pecans, crumbled bleu cheese, and creamy vidalia onion vinaigrette on the side. It is a popular salad and when I mentioned to others who live in the area that I had it multiple people said it was one of their favorite things on the menu. Dave had the Miami Vice which is a classic grilled cuban sandwich with roast pork, ham, pickles, and swiss. He said it was hearty and filling and while he enjoyed it, there were a number of other things on the menu that he would love to try as well. 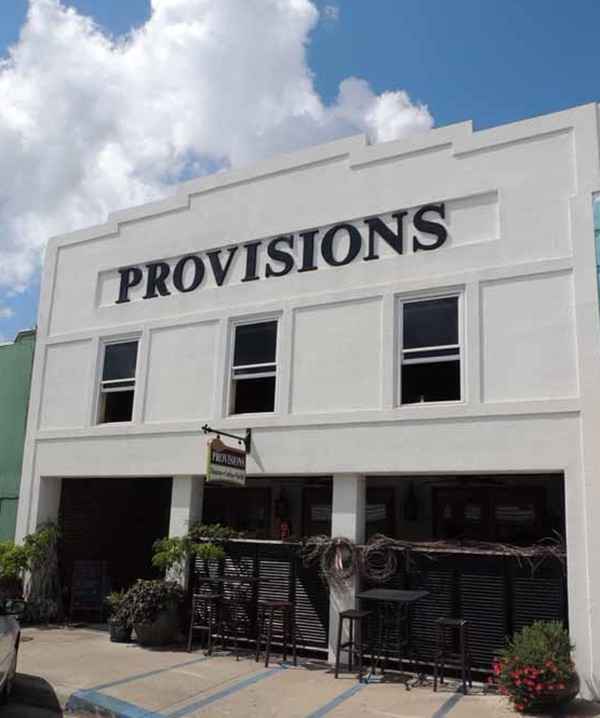 Provisions is a lovely place and we recommend it to those who enjoy fine dining and fine wine. The menu is well priced and there it seems to be a popular spot for locals. 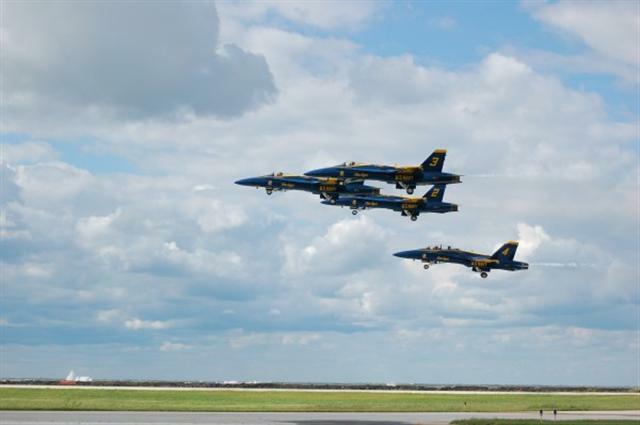 While there for lunch a number of them stopped over to say hi to each other or waved hello on their way in or out. They also offer catering so if you are attending events in the area you may have a chance to enjoy their dishes off site as well. There were two places that we didn’t have time to try but I felt should make the list. 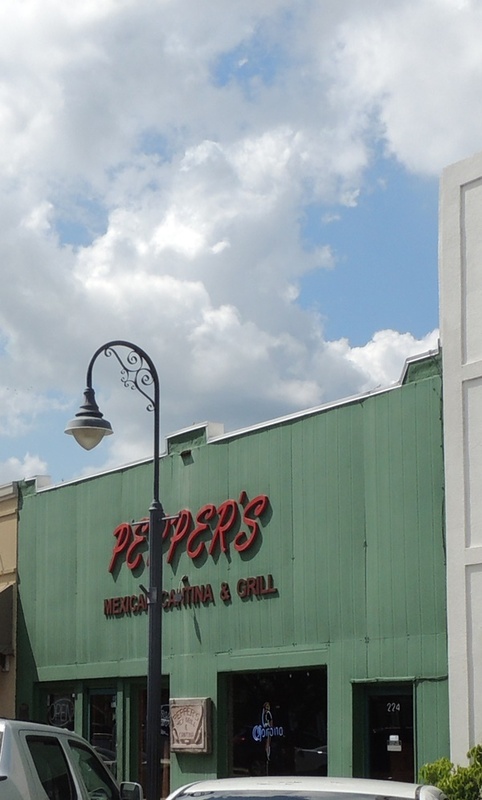 Whenever we asked anyone local where their favorite place was to eat, 9 times out of 10 they would enthusiastically say, “Pepper’s!” They offer a wide variety of Mexican food with fresh dishes made daily. From what I’ve heard the prices are reasonable, the food is good, and their Monster Margarita is a popular and fun drink of choice. 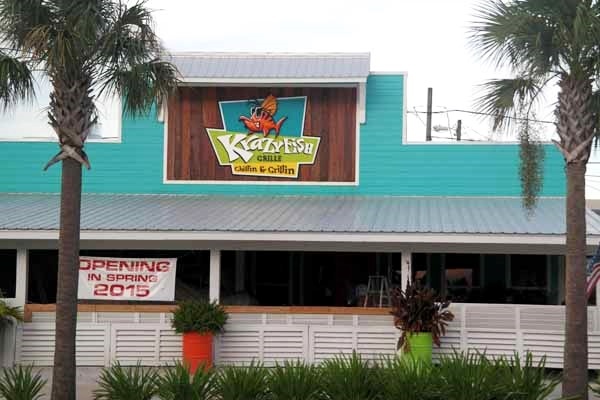 I couldn’t find any info on Krazy Fish Grille, other than it doesn’t open until spring of 2015, but on our trip every time we drove by I kept wishing we could stop in and relax on the porch or patio. It has an eye-catching and colorful design and a fun feel about it. I’ll be keeping my eye out for news about it and will be adding it to our list the next time we are in town. As you can see there is quite a wide variety of places to eat in Gulf County Florida. They all offer something a little different, each having their own personal touch, while keep food and atmosphere at the top of the priority list. I look forward to returning to area some day to try many of these places again and to discovering new dining options as well. 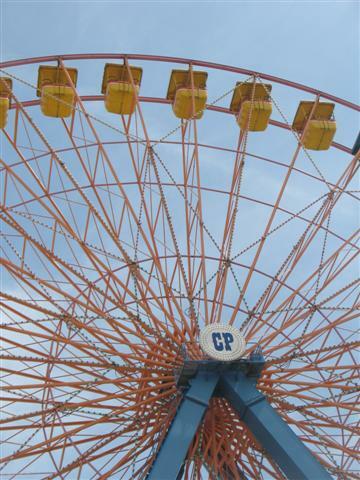 For more information about Gulf County visit the VistGulf.com website. These all look like such fun places to eat at. I would love to visit them all!